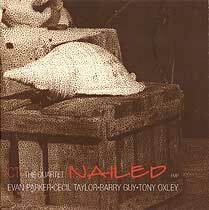 Evan Parker, soprano and tenor saxophone; Cecil Taylor, piano; Barry Guy, double bass; Tony Oxley, drums. Recorded at the Bechstein Concert Hall, Berlin on 26 September 1990. Booklet (front cover reproduced above) layout by Jost Gebers; photograph by Dagmar Gebers.